Ricochet and Away! : QAYG progress report: nearly done! 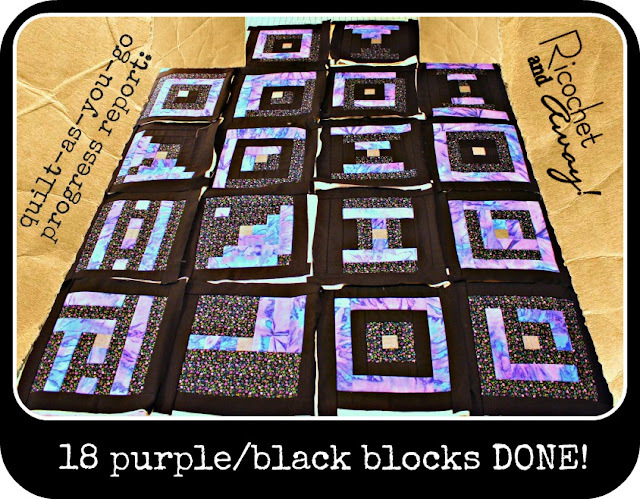 Today I'm proud to say I've got ALL MY BLOCKS DONE!!!! This quilt top is made entirely of fabric from my stash. I didn't purchase any of it from the fabric store. 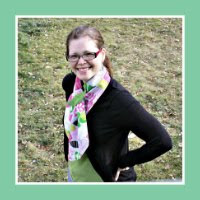 Thrift stores, garage sales, and hand-me-downs are my fabric sources. I figured this was such a big project (that I might not finish) that I better not spend a bunch of money on it. I feel like I did the best I could with what I had to work with. All the blocks are different. They are different versions of the log cabin style of block assembly. I know this must be bothersome for some of you. 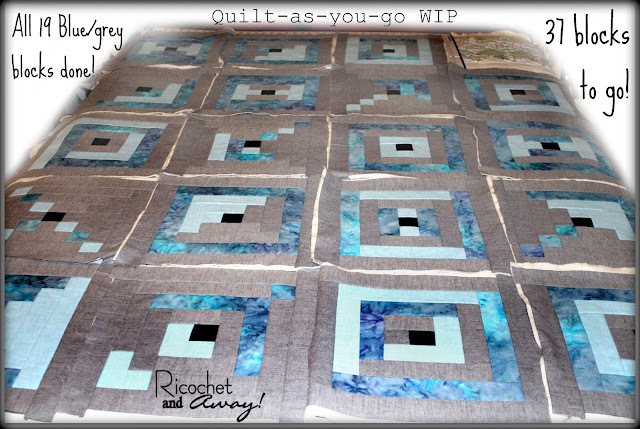 Mr. Ricochet has admitted to "not understanding" my aversion to making identical blocks. The simple truth is that I don't do tedium. 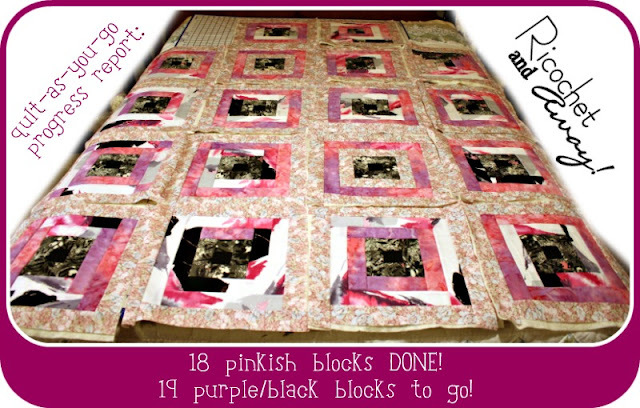 After I made the second block I had an idea of how to vary the layout of the next block. As I sewed the new variation, I came up with something new to try for the next block. That's how it went, block after block. Originally, I was going to follow my sewtakeahike tutorial and assemble the quilt top, center it on a solid backing, stitch in the ditch to quilt the front to the back, trim and bind the edges. 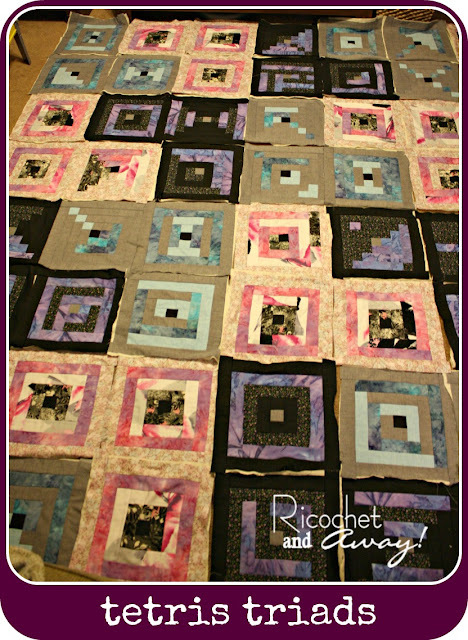 Then, I found another QAYG tutorial where you cut up the backing into squares as well. 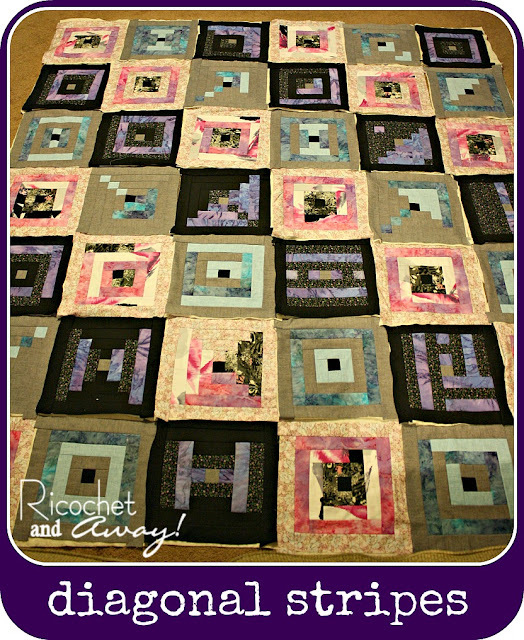 You quilt the backing squares to the top squares and sew them together like you would a quilt top. The seam allowances on the back side of the quilt are then covered with strips of sashing (like bias tape). Then you trim and bind the edges. Please forgive all the crappy basement photos. 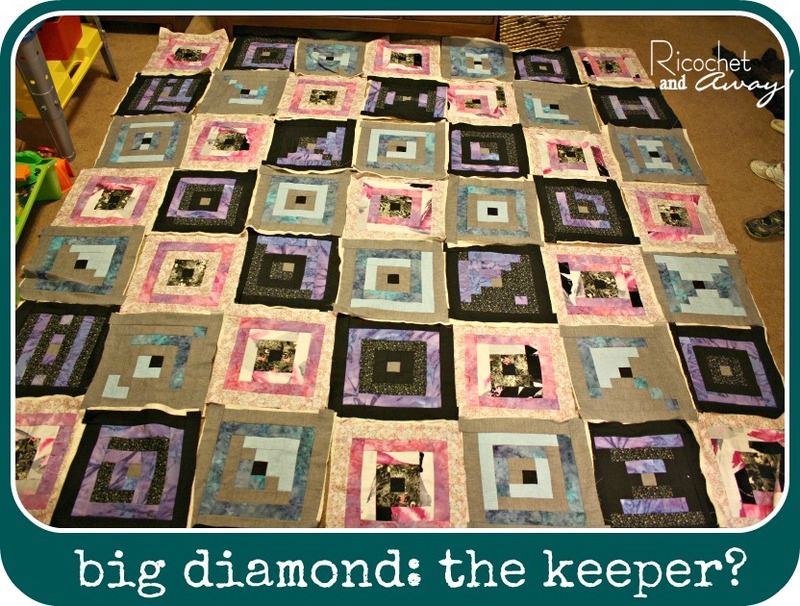 It's a little too damp outside to lay out my quilt blocks on the lawn. I'd love hear your opinions. I'd love to hear about your own QAYG projects as well. My favourite is the diamond, Rikka... looks great!!! I love the diamond formation the best. I haven't tried quilt as you go yet, so no suggestions there.